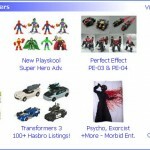 Toyark Sponsor Big Bad Toy Store has provided us with this weeks update. And it’s a doozy. There are so many new items on pre-order and new arrivals that they have skipped the product descriptions this week. 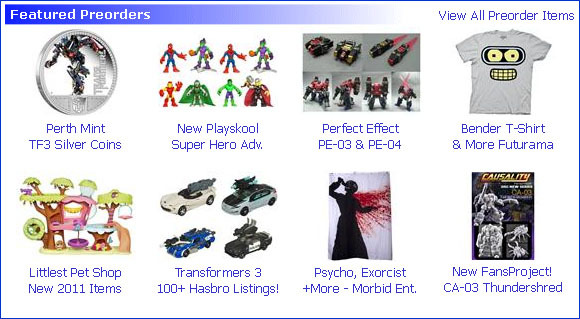 Everything from Transformers: Dark of the Moon, to Marvel Universe to Green Lantern and a whole lot more. There’s so much, I wouldn’t even dare try to pick highlights this week. See all of this weeks listings by clicking the headline of the story. They look much better than expected! Definitely gonna get the Johnny Cage, Scorpion and Sub Zero figures...can't wait to see the other series they plan on releasing...smaller scale i believe? Not sure what other scales they have planned. They've promised us more info as they are allowed to release it. They are also planning a 4" scale line. BBTS has them available for pre-order here. Honestly, not too thrilled at this point. The ninjas look nice and Raiden looks pretty good (his has looks a little high on his head) but that Johnny Cage looks really cheap to me. Can't wait to see the 4" classic figures. Guess I gotta buy two each of Scorpion and Sub-Zero... one set for me and another for a good friend of mine. I hate it when things turn out this awesome. Means I have to spend money. Prototypes look good. Cross my fingers that the final figures hold up. Wish there was a little muscle shading done, but oh well. Looks far better than the old Deception and Shaolin Monks toys so far. Raiden is a definite buy, probably get Scorpion and Sub-Zero and touch up the paintjobs. Pass on Johnny. Head looks odd. Reminds me of a cross between Duke Nukem and Tommy from Power Rangers. These look pretty good actually. They're not that exciting to me, but look decent enough. i was kinda expecting more from these, they aren't really all that awesome looking. underwhelming is the best word that i can think of. cage just looks weird. not in a good way. awwww... I am really expecting the 4" ones, but given the fact that the big ones are not as good as expected, I am begining to wonder if the smaller scale ones are going to be any good. I�ll still keep my fingers crossed. Yeah, don't think they're much of an improvement on the old Shaolin Monk figures but still looking forward to the 4" figures. I reckon the SDCC exclusive will be 4" cybernetic Sub-Zero. they look decent. Much more interested in seeing the Megaman and Adventure Time stuff, though. Is there a release date on these? Ummm...yeah, I'm with "imsohappy" on this one. I don't get what some of you guys are excited about. All those head sculpts look pretty awful. The only half-decent one is Sub-Zero, and hooray! He happens to be favorite! Well I was really looking forward to some of the female fighters to be released as figures, but seeing these faces so far has really crushed any hopes of that (any good looking ones anyway). By the way, has there been any word on any female figures coming like Sonya, Jade or Kitana??? Subs and Scorpion look ok sculpt wise (though Scorp's eyes look a bit big, like he's suprised) but Raiden and Johnny are pretty bad. I'll still pick these up though since there the only MK figures around atm and I seriously hope we get a Shao Kahn, Kitana, Mileena, Kintaro, a new Goro and Skarlet in this line. I would LOVE for Mattel to get the license and make MK vs DC two-packs, based on the gawd awful game, with MK characters designed by 4H. *drool* These are ok figures, for kids to play with, but not really on par with anything in the collectible market... and kids who still play with toys really shouldn't play Mortal Kombat. Some MK figures by the Four Horsemen would be awesome. I think MK would also be a great line for NECA especially if they have the same articulation as their Ryu Hayabusa. Glad to finally have pics, but that Johnny is an odd one. The others I'm okay with, but I'll still need to see them in person before I pull the trigger. I want to like them, really. Ice sword - too awesome.